What is the National Certificate (Engineering & Related Design) programme? 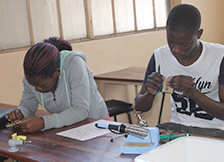 The National Certificate (Engineering & Related Design) is a programme at each of Levels 2, 3 and 4 of the NQF. This programme is designed to provide both the theory and practice of Engineering & Related Design. The practical component of study will be offered in a real workplace or in a simulated workplace environment. It will provide students with an opportunity to experience work situations during the period of study. The National Certificate (Engineering & Related Design) programme is a full year programme at each of the NQF levels of study. A student is issued with a certificate on the successful completion of study, that is Level 2, Level 3 and Level 4. Which subjects make up a National Certificate (Engineering & Related Design)? In order to obtain a National Certificate (Engineering & Related Design), a student is required to take a total of 7 subjects. These include 3 fundamental subjects and 4 vocational subjects. What are the Vocational subjects in Engineering & Related Design? What career opportunities do I have after completing the National Certificate (Engineering & Related Design)?